LONDON, UNITED KINGDOM, 20 November 2018 – Wyndham Hotels & Resorts, the world’s largest hotel franchisor and leading provider of hotel management services, with more than 9,000 hotels and 20 iconic hotel brands, today unveiled an exciting new direction for the Ramada Encore by Wyndham brand globally. Recognising that today’s traveller has more choice than ever before, at the heart of this new identity is a brand promise to be “Refreshingly Different”, which is underpinned by the brand’s core attributes of being fresh, approachable and vibrant. This new identity includes a redesigned and reimagined logo, created by London-based marketing agency Octopus Group, and prototype designs for guest rooms and common spaces designed by hospitality architecture firm Harrison. Ramada Encore by Wyndham is a portfolio of 54 hotels in 20 countries around the world. The brand was created in the late 1990s as a limited service midscale hotel brand designed for business and leisure travellers who were looking for great value in a simple and smart hotel. At the time of its launch, the brand introduced revolutionary new concepts, including guest rooms with all wood flooring and an open plan, multi-purpose common area that serves as a reception, lobby, casual dining and networking space. The newly redesigned Ramada Encore by Wyndham logo. Core to the new creative identity for the brand is a logo re-design, aimed at modernising the visual representation of the brand and appealing to a new generation of traveller. The multi-coloured “E” mark was designed to reflect continual movement through the rotation of the letter, symbolising “to return” – the definition of the word encore. In addition, the brand has received an all new colour palette, which reflects its vibrancy, energy and approachability. Beyond the visual identity and logo, new prototype designs for public areas and guestrooms are also being introduced. 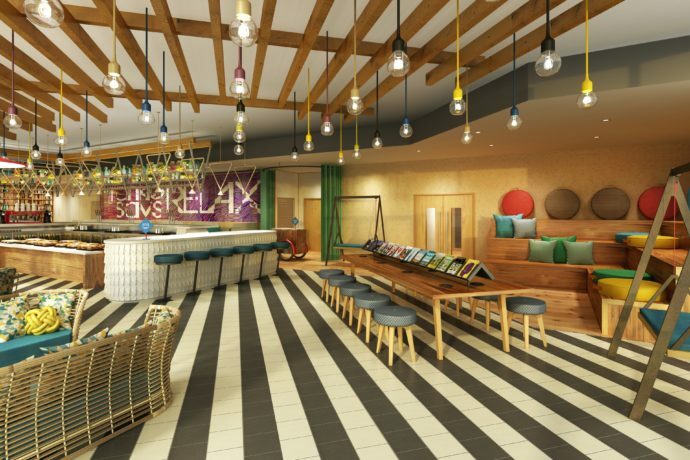 These evoke a spirit of the modern traveller, with well-designed accommodation, fused with completely reimagined multi-functional common areas where guests can eat, drink, work and connect. On arrival they are welcomed via a deconstructed bar, which breaks down the normal relationship between a lobby, reception and restaurant, and allows for the space to be used in different ways throughout the day. 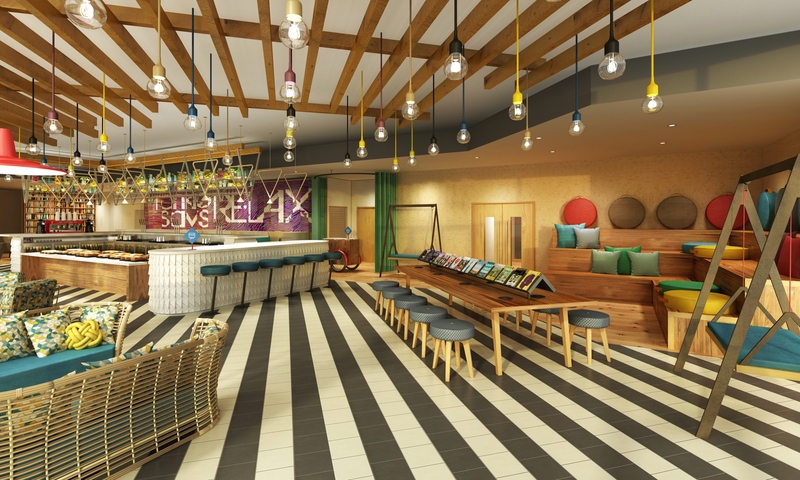 Different seating options such as multi-tiered benches and semi-private booths will offer optimal spaces for socialising or quiet reflection, and technology will streamline the arrivals process and allow guests to get on with their stay. Ramada Encore by Wyndham hotels around the world participate in Wyndham Rewards®, the simple-to-use, revolutionary loyalty programme that offers over 59 million members a generous points earning structure along with a flat, free-night redemption rate – the first of its kind for a major hotel rewards programme. For more information, or to join, visit: www.wyndhamrewards.com.